JTAG-lock-pick is an ARM core processors JTAG using USB bus to connect to PC. 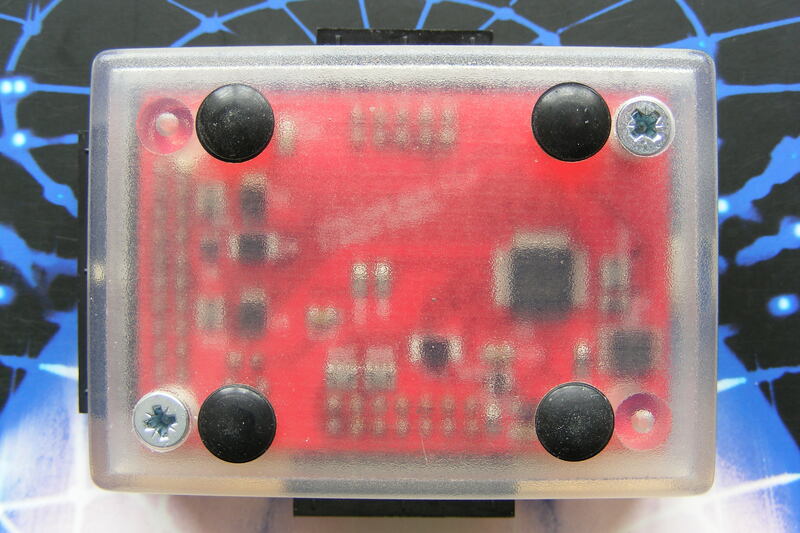 The device is based on FTDI FT2232 chip – a dual channel USB <=> UART/FIFO converter. 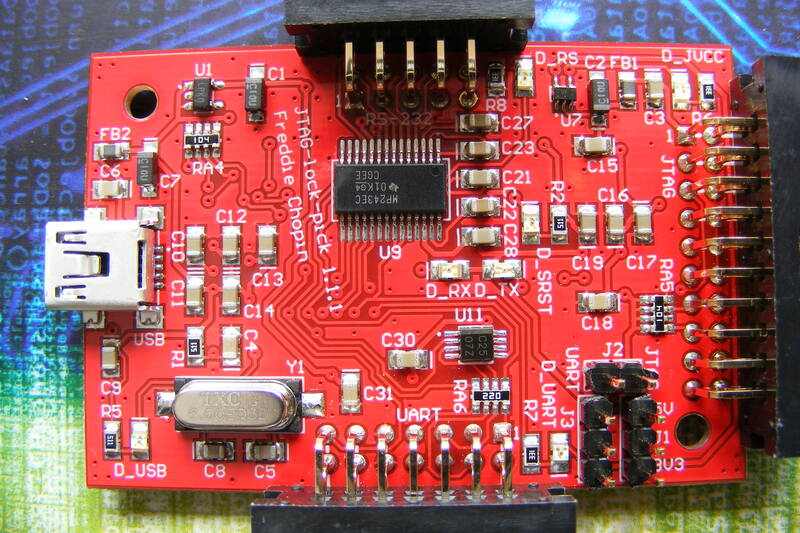 By design first channel is connected to JTAG interface and the second one has full UART / RS-232 interface (RXD, TXD, RTS, CTS, DCD, DSR, DTR, RI) with option to connect to RS-485 converter. JTAG-lock-pick project was created to be an uncompromising and powerful solution, taking maximum advantage of all used ICs. Maximum frequency of JTAG interface’s clock is 6MHz. 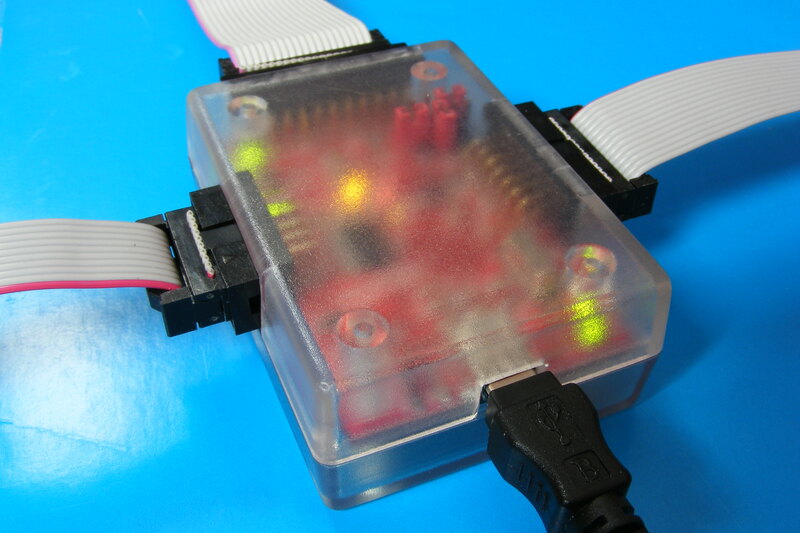 Thanks to USB bus the device can be connected to any PC on the market – it would not be possible with parallel interface (LPT), which is completely obsolete nowadays. Thanks to use of 74LVC series advanced line buffers, target devices with very wide range of supply voltage – from about 1.6V up to 5.5V – can be connected. 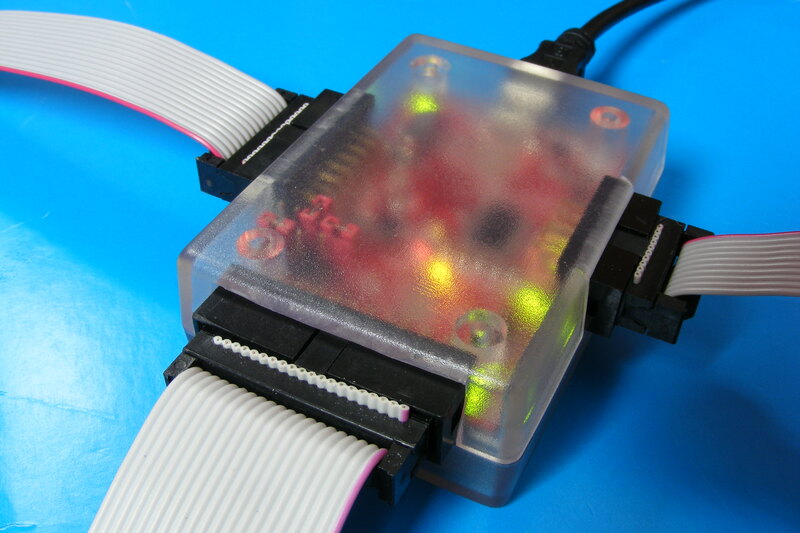 One of project’s requirements was to have both UART and RS-232 interface. Selection between RS-232 and UART is automatic and based on presence of UART interface’s line buffers’ supply voltage – if this voltage is higher than about 1.7V then UART interface is enabled. Four most important signals of UART interface (RXD,TXD, RTS, CTS) are also buffered with 74LVC series level shifters. Other lines are driven directly by FT2232 chip – output signal’s high level voltage is 5V, input’s high level voltage is (typically) about 1.6V. 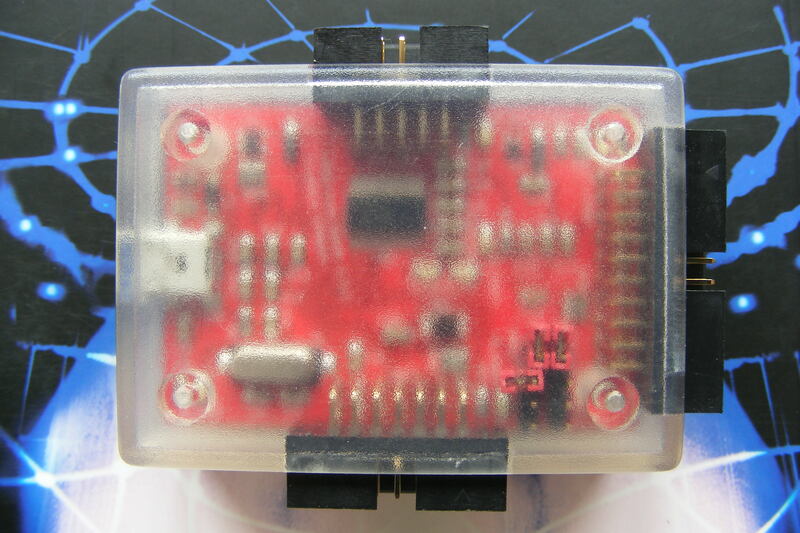 Thanks to having TXDEN signal on UART connector, RS-485 converter can be connected to the device. Designed circuit faciliates powering of line buffers – and thus target device (via JTAG / UART connectors) – with 3.3V or 5V voltage. UART’s and JTAG’s supply rails are separated, additional jumper allows to connect them, so various voltage configurations are possible. USB bus is the source of these voltages, maximum current drawn by the target is 500mA for 5V voltage (according to specification) or 150mA for 3.3V voltage, which is more than enough for complex digital devices without power circuits. JTAG-lock-pick is fully software compatible with JTAGkey interface from Amontec, so in many applications available configurations can be used instead of creating them manually. It is also possible to program FPGA, CPLD and AVR chips with SVF files using JTAG-lock-pick and software provided by Amontec. JTAG-lock-pick has separate SRST and TRST lines, which can be independently configured to push-pull or open-drain mode. JTAG-lock-pick project is a successor to 4R|\/|-JT4G Rev02 project, eliminating it’s shortcomings. Most important one – predecessor had SRST i TRST lines shorted “by design”, which limited debugging capabilities. 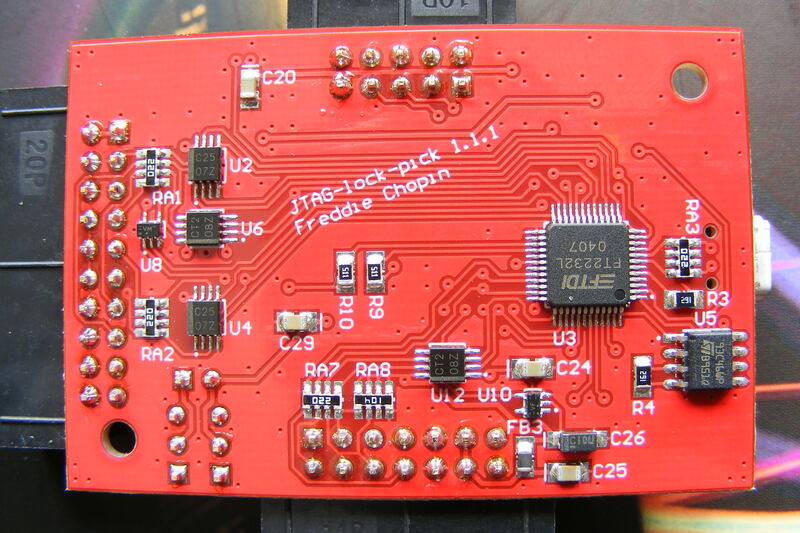 Additionally the buffering IC used previously – 74VHC244 – had a significant flaw, which resulted in breakdown of input voltages through clamp diodes on unconnected supply rail, which was very confusing but perfectly safe for JTAG and target device. These problems do not occur in JTAG-lock-pick. The only limiting factor is support for specific chip in PC software. DVD with manual, drivers, set of useful software – free (CodeSourcery GCC toolchain, Eclipse IDE, OpenOCD, CooCox CoIDE) and proprietary in evaluation versions (Atollic TrueSTUDIO for STM32 Lite, Keil MDK-ARM + CooCox CoMDKPlugin, IAR Embedded Workbench for ARM + CooCox CoIARPlugin, Rowley CrossWorks for ARM) – all of them in the most recent versions.